The first real step towards a world of Jonny Quest rocket planes traversing the globe. For decades I have heard the stories about Tulsa’s dirigible mooring mast. But lately it seems to have gained traction, despite a lack of any real evidence. Numerous websites, newspaper articles and Wikipedia all mention the mooring mast atop the 320 Boston Building. But is it true? Latest estate sale find: Stunt Trainer, a 1963 model airplane by Wen-Mac. Wen-Mac was a subsidiary of AMF based in Los Angeles. They made flying model planes with glow plug engines similar to the more popular Cox models. We’ll soon have this up on eBay so check my auctions for the latest listings! Any Tulsan worth their Quittin’ Time knows Urbana at 61st used to be a runway. The air field was called Tulsa Commercial. But did you know that runway is not the only remnant of this airport? East 58th Place is built on top of the crosswind runway. The original concrete is still intact and markings are visible in certain places. Presumably the developers of the Holiday Hills subdivision didn’t feel the need to break up all that nice concrete. Another nifty fact: what used to be the office/restaurant is a private home today. It has a huge kitchen and two bathrooms side by side! In case you haven’t heard, AA and their parent company filed for Chapter 11 bankruptcy Tuesday morning. It’s naive to think this wasn’t possible. But after surviving 9/11 and the crash of 2008 I thought they may have been out of the woods. As you may know, on Tuesday, November 29, American Airlines filed for reorganization under Chapter 11. We took this action as part of our efforts to secure our long-term success in delivering the highest standards in air travel. We are committed to meeting your travel needs with outstanding customer service and safety, and it will be business as usual at American throughout our reorganization process. More than 80,000 people at American appreciate your loyalty and look forward to continuing to serve you. We want to assure you that your AAdvantage® miles are secure. The AAdvantage miles that you’ve earned are yours and will stay yours, subject to usual policies, until you choose to redeem them for a great award with us. Likewise, your elite qualifying miles and your elite status, including lifetime status granted under the Million MilerSM program is secure and remains intact. You will continue to earn miles through all our existing AAdvantage participating companies and you will be able to redeem those miles for the same great awards — flights, upgrades, car rentals and hotels just to name a few. And, throughout the coming year, we will be adding even more opportunities to earn miles, as well as new ways to redeem those miles. American is honoring all tickets and reservations as usual, and making normal refunds and exchanges. And, we intend to maintain a strong presence in domestic and international markets. As we and all airlines routinely do, we will continue to evaluate our operations and service, assuring that our network is as efficient and productive as possible. Additionally, relationships with our oneworld Alliance and other codeshare partners are continuing to provide you with opportunities to earn and redeem miles for travel to hundreds of destinations worldwide, and we are honoring all tickets and reservations for travel on our partner airlines as usual. For information about American’s reorganization process, please visit AA.com/restructuring. Even more importantly, we remain committed to providing a superior customer experience with a focus on delivering what our customers value most — the newest fleet with our upcoming aircraft deliveries, network strength in the important cities of the world and world-class products, service and technology. American Airlines has a proud history, and we will have a successful future. All of us on the American team thank you for your loyalty and we look forward to welcoming you aboard soon. In a recent news release a bold new endeavor was announced to combine luxurious accommodations and rotating wing aircraft. 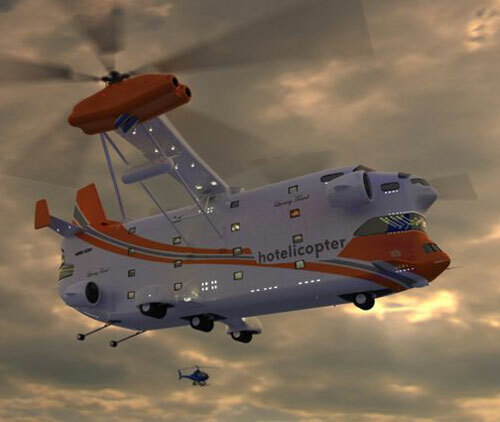 The Hotelicopter offers 18 guest suites grafted on to a Soviet Mil V12 helicopter. When questioned about the name, and its similarity to a hotel booking site, Farley was elusive.